The Second Annual "National March for Immigrant Rights" is scheduled to be held on the U.S.-Mexico border on February 2nd. Last year, the march was also held on February 2nd. What's going on here? Why February 2nd? Answer: February 2nd is the anniversary of the signing of the Treaty of Guadalupe Hidalgo. That 1848 treaty officially ended the Mexican War and legally turned over most of the Southwest to the United States. The average American doesn't know much about the Mexican War and thinks about it less. But here in Mexico they do think about it—a lot. In Mexico, everybody knows that "the U.S. took half our national territory." "La Intervención Norteamericana" has been described—by Mexican writer and Nobel laureate Octavio Paz—as "one of the most unjust wars of conquest in history." Not only that, but the loss of Mexico's northern territories has been used as a reason—an excuse, really—for the economic failures of Mexico compared to the economic success of the United States. According to at least one poll, conducted in 2002 by Zogby in Mexico, 58% of respondents agreed with the statement that "the territory of the United States' Southwest rightfully belongs to Mexico". [MS Word] Now that's definitely a different perspective. In a lighter vein, some Mexicans jokingly quip that, when the U.S. took half of Mexico's territory, we took the half with the paved roads. It's time for a reality check. Different nations have different historical perspectives on the same historical events. That's one reason they are different nations. Of course Mexicans say that the U.S. took (or even "stole") the Southwest! Why wouldn't they? We've got to get over this naïve belief that everybody in the world has the same values, and that everybody wants to be just like us. Maybe we should have thought twice about importing millions of people from the only country on earth with an irredentist claim against us—and then encouraging them not to assimilate! Even some of the arguments used on our side are a little lame. Some try to prove the territory wasn't conquered. After all, we did pay $15 million dollars for it. True, but that makes it sound like a garden variety real estate deal. Mexico was soundly defeated, and as defeated nations throughout history, had to abide by the terms of defeat. It was a conquest. And historically there's nothing unique about that. Just about every country in the world was formed by some type of conquest and just about all the real estate in the world has been conquered and re-conquered, some of it quite a few times. That includes Mexico. The contemporary conventional Mexican view is that the evil Spaniards conquered Mexico. But when Hernan Cortes arrived in 1519, the present-day country of Mexico did not exist. The Aztec Empire (itself a product of conquest) only covered about a quarter of present-day Mexico. After the Spaniards conquered that empire, they went on conquering numerous other indigenous entities, including the Tarascan Empire, enemy of the Aztec Empire, thus assembling the enormous colony of "Nueva España", which was renamed Mexico after independence. Furthermore, throughout the history of independent Mexico, the government has repeatedly used force to subdue rebellious tribes and areas and keep them in Mexico. So yes, Mexico was formed by conquest as well. Nor is invading a neighbor country at all rare. In fact, it's the most common form of international invasion there is. And supposing the Mexican War hadn't started in 1846, it's quite probable Mexico would have lost the territories anyway. The region in question was far from the heartland of Mexico, and sparsely settled. Neither the Spanish Empire nor the independent Mexico which succeeded it did much to develop the area, which was prone to frequent anti-government uprisings. In the 1840s, there was speculation that the British, the French or the Russians might take try to take it. But the most likely possibility would have been that growing communities of unassimilated American settlers would have revolted, seceded from Mexico, and joined the U.S. It was the Texas dispute that provoked the Mexican War. Americans had settled in Texas, they didn't assimilate, they became the majority, and seceded from Mexico in 1836. That was not the first time that Mexico lost territory. Upon independence in 1821, Central America had been part of Mexico, but Mexico lost that territory in the 1820s. Funny, I never hear about a Mexican "reconquista" of Central America. The Republic of Texas was independent from 1836 to 1845, during which time it was diplomatically recognized by the U.S., France, Britain, Holland and Belgium, and Mexico was unable to get it back. After Texas joined the Union in 1845, the dispute erupted again. Both countries sent troops into the disputed territory between the Rio Grande (which Texas said was the border) and the Nueces River (which Mexico said was the border). In April 1846, the two armies clashed in the Thornton Skirmish, followed by several battles in May of 1846, after which President Polk asked for and received a declaration of war from Congress. Three months later the Mexican Congress reciprocated. Nowadays, of course, the war is seen as the attack of a strong U.S.A. upon a weak and peaceful Mexico. But at the time, both countries were about equally hawkish and ready for war. Mexico had a larger full-time military (27,000 Mexican men under arms vs. a U.S. Army of about 7,000 soldiers—a number which soon swelled when volunteers flocked to join). Nowadays, the idea of conquest is very unPC. But in 1846, neither the U.S. nor Mexico was against the idea of conquest in principle. It's just that each country wanted to be the conqueror and not the conquered. Mexico's government planned an invasion of the U.S., predicting that as Mexico invaded, the slaves would revolt and the Mexican flag would fly over the U.S. capitol in Washington. The Mexican government planned to annex parts of the United States, in the Louisiana/Alabama region. What a plan! Brigadier General Zachary Taylor ("Old Rough and Ready") invaded and occupied part of northeastern Mexico, including the city of Monterrey, which fell after a fierce battle involving house-to-house combat, in September of 1846. After the battle of Buena Vista (February of 1847), conventional war in that theater was over, though there were guerrilla attacks against U.S. forces. In another prong of the invasion, Colonel Stephen Kearny marched west from Fort Leavenworth, Kansas, taking Santa Fe and arriving in California. There Kearney linked up with Captain John C. Fremont and some of those unassimilated American settlers who had already declared independence from Mexico. On July 7th, 1846, the Navy landed and did its part. By February of 1847 fighting in this theater was over. Mexico had still refused to surrender. So President Polk sent an invasion force to take Mexico City. This expeditionary force, under the command of General Winfield Scott ("Old Fuss and Feathers") landed at Veracruz, on Mexico's Gulf Coast, and carried out the largest American amphibious landing up to that time. Veracruz was taken in March 1847. 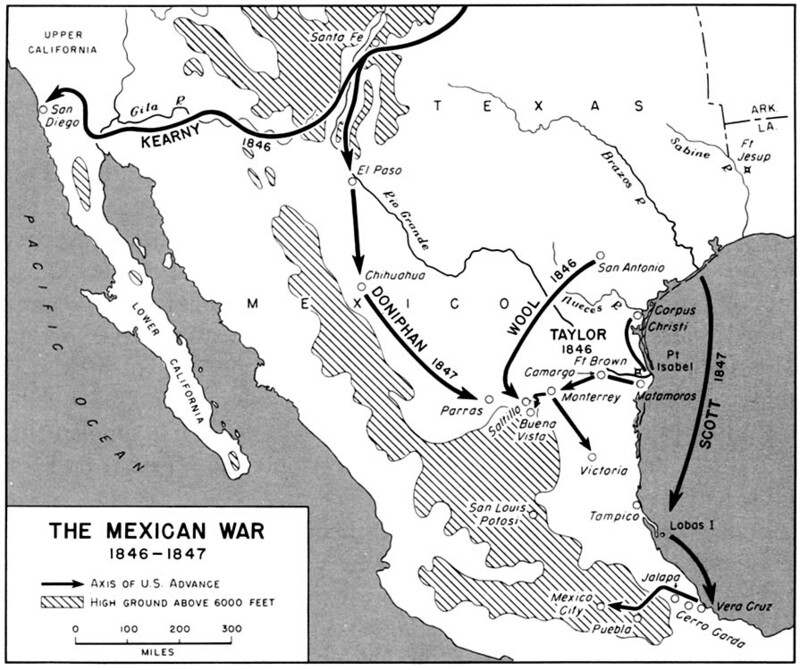 Then the U.S. Army fought its way inland to Mexico City, taking the same route [Map] as Hernan Cortes in 1519. Among the soldiers who fought under General Scott was a member of the Indiana Volunteers by the name of Robert Wall—my first cousin 4 times removed, the first member of my family to go to Mexico. After returning to Indiana, for the rest of his life my kinsman was known as "Mexican Bob". Mexican Bob had two cousins also named Robert Wall— a funny cousin known as "Monkey Bob" and a feisty one known as "Spunky Bob". Spunky Bob was my great-great-grandfather. With the fall of Mexico City in September of 1847, major combat operations were over, although in both Taylor's and Scott's occupation zones, there were continued enemy attacks on U.S. supply convoys—just as in Iraq today. Why did the American army defeat the Mexican army? "…the mutual confidence between the leaders and officers did not exist, the weaponry was old and defective, the artillery was small and of short range, the cavalry was mostly useless, the movements were slow and heavy, and finally, ambulances and supplies of provisions and everything necessary for the good service of an army on campaign were lacking. "(México Á Través De Los Siglos Vicente Riva Palacio, 1880). Mexico's loss was also due to internal disunity. In the face of the American invasion, Mexico's leaders did not form a government of national unity and work together to defend their country. Instead, Mexican leaders often seemed more concerned with maneuvering against each other than against the enemy. In December of 1845, with war imminent, General Mariano Paredes was sent north with an army to face off against the Americans. But on the way, he changed his mind and decided instead to return to Mexico City and overthrow the government. That's how the more hawkish Paredes became president, replacing Jose Joaquin de Herrera, who was willing to compromise on the Texas issue. In August of 1846, Paredes himself was deposed by Mariano Salas. The presidency actually changed hands four times that year and by March of 1847, Antonio Lopez de Santa Anna was in charge of both the government and the military. He resigned after the Mexico City defeat of 1847. Also during the war, the Mexicans had an internecine dispute about church property, an attempt to install a Spanish monarch, and about 35 uprisings throughout the country. Some Mexican communities didn't support the war effort, and had no qualms about trading with the American enemy. Others were simply indifferent and stayed out of it. The Yucatan Peninsula, which had been independent from 1841-1843, declared independence again on January 1st, 1846 and announced its neutrality during the Mexican War. But the indigenous Maya revolted against Yucatan's white elite in the "Caste War", which broke out in 1847. The whites were forced to retreat into the walled cities of Merida and Campeche in 1848. After the U.S. withdrew from Mexico, Yucatan's leaders rejoined Mexico. It began a long drawn out reconquest of the Maya territory which didn't end until 1901. The Mexican War had its contemporary American critics, mostly among the Whig party. Critics of the war included former president John Quincy Adams, John C. Calhoun, Ralph Waldo Emerson and Henry David Thoreau who spent a night in jail because he refused to pay a $1 tax in protest. Abraham Lincoln opposed the use of the Thornton Skirmish as justification for the war, although he still voted for funds to supply the U.S. Army in Mexico, and later supported Zachary Taylor's presidential campaign. Among the 200 junior officers in the war who wound up being generals (Union and Confederate) in the Civil War, was future president Ulysses S. Grant, who at some point in his life decided that the war was evil. But whatever Lincoln and Grant thought about the Mexican War, as president, neither man offered to give the conquered territories back to Mexico. When Mexican leaders signed the Treaty of Guadalupe Hidalgo in 1848, they were almost out of money and the country was on the verge of a revolution. American troops had defeated the Mexican army, were occupying strategic parts of the country, and negotiator Nicholas Trist made clear that without a transfer of the territories, there would be no treaty. So the Mexican leaders decided to sign the treaty to avoid greater losses. It was signed on February 2nd, 1848 and ratified by both congresses several months later. The U.S. Army withdrew from all the territory it was occupying except the newly-annexed territories. So the Southwest is part of the U.S. and has been for over 150 years, longer than most present-day national states have been in existence. Even the Mexican Constitution doesn't claim the Southwest! That's right. The Mexican Constitution, in articles 42—48 [Word Document] spells out the extent of Mexican territory. It mentions Mexican islands, continental shelf, and airspace, Mexico's 31 states and federal district, but it never mentions California, Texas or Arizona. So take that, you reconquistas! When reflecting upon the Mexican War, some Americans ask why we didn't just annex the whole country. And there were actually people in favor of that—the "All Mexico" movement. But there were several reasons that didn't happen. One was America's North-South divide, especially the congressional balance between free states and slave states, with northerners fearing that Mexico would be divided into slave states and thus upset the balance. But John C. Calhoun and others opposed annexing Mexico for National Question reasons. In 1848, the U.S. population was about 21 million, and the population of Mexico about 7 million, a third of ours. How well could we have assimilated 7 million Mexicans, with all the racial, cultural, social, nationalistic differences that would have been involved? Annexing Mexico would have changed the character of our nation. Ironically, today's leaders have no such qualms. Today our leaders apparently see no problem in merging us with Mexico, despite the differences between our societies. They are merging our countries on several levels. At one level is the mass migration of Mexicans into the U.S. coupled with a multicultural ideology which encourages non-assimilation and retention of their Mexican identity. At another level, inter-governmental agreements are moving us closer to some sort of North American Union. It's a century and a half after Guadalupe Hidalgo. Who will be the winners in this century? Will it be the U.S.A., Mexico—or a transnational elite, for whom all the residents of our continent are just interchangeable pieces in a vast market? The next few years will give us the answer.